It's interesting how you don't really expect surprises from some bands. Admittedly, it did surprise me that they'd go ahead and do no less than three cover CD's, but, still, for me, SFU is one of those bands from whom you just expect a stable, high quality death metal output. Anyway, this time I must say I've been caught with my pants down. Barnes and his rejuvenated troupe has turned the ship around. 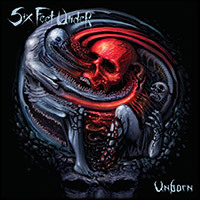 With songwriting aid from Whitechapel's Ben Savage and Jari Laine from Torture Killer, Chris Barnes and Six Feet Under has spawned what I consider the best death metal album so far this year (and, no, I haven't listened to the new Suffocation yet!). Especially the riffing is vibrant and dynamic in a way that I really, really like. Amazing hooks, melodic stuff and heavy, crunchy chugging in a sweet blend adorn the songs of 'Unborn' - most notably tunes like Neuro Osmosis, Incision, Fragment, Inferno (groovy as f*ck!) and Psychosis have impressed me with their diversity, beauty and at the same time brutality. To put it short, 'Unborn' is nothing short of a groovy killing machine! Very metal.